1. Soak almonds in filtered water for 8 hours. Rinse and drain. 2. Blanch soaked almonds by pouring very hot water on them and let sit for 5-10 minutes. 3. Remove the skins by pinching the almonds between your fingers. 4. In Vitamix or food processor goes blanched almonds, 1/3 c. water, Celtic Sea Salt, apple cider vinegar and lemon juice. 5. Blend until smooth. 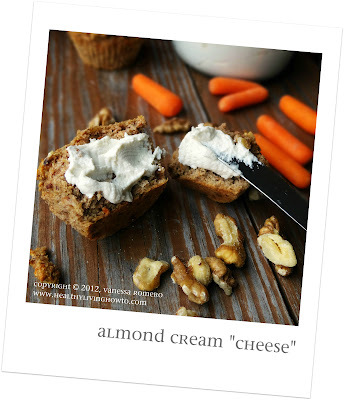 Voilà almond cream cheese. If having difficulty getting almonds smooth, you can add additional water and then strain cream cheese or you can add coconut oil. I have done both with excellent results. I prefer adding coconut oil as it lends a great texture and you don't have to wait for the additional moisture to strain.